There is just something comforting about coming home and walking in the door to that oh so delicious smell! 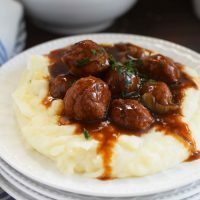 You know the slow cooker has been working so hard for you all day! 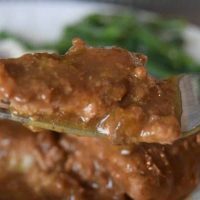 This Crock Pot Country Steak with Gravy just fills the air with that aroma that wraps around you like a big hug after a long day! The Crock Pot is “one” of my favorite things in my kitchen! It makes my life so much easier! What about you? What is your favorite appliance in your kitchen? Truthfully, I can’t pick just one, because I would be lying to ya, but this one is up there at the very top of the list! So just what has this country “cubed” steak has been doing today? Why cooking away of course and while you were not home. Can you believe that? It’s magically getting all nice and tender and you are away and doing none of the hard work. But I tell you, it’s just sitting there all patiently waiting for someone to come home to complete this meal. Perhaps with some delicious Instant Pot Mashed Potatoes and Instant Pot Garlic Butter Green Beans! 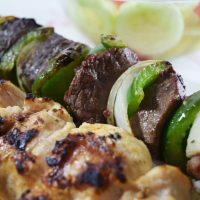 Whatever you decide to enjoy this with, there is tons of flavor packed in this easy to make meal! You may want to leave off the garlic salt! This is a very salty dish! But my family you know they are salt-a-holics! I am trying to get them help! Get the crock pot sprayed with a little cooking spray, add in the meat. 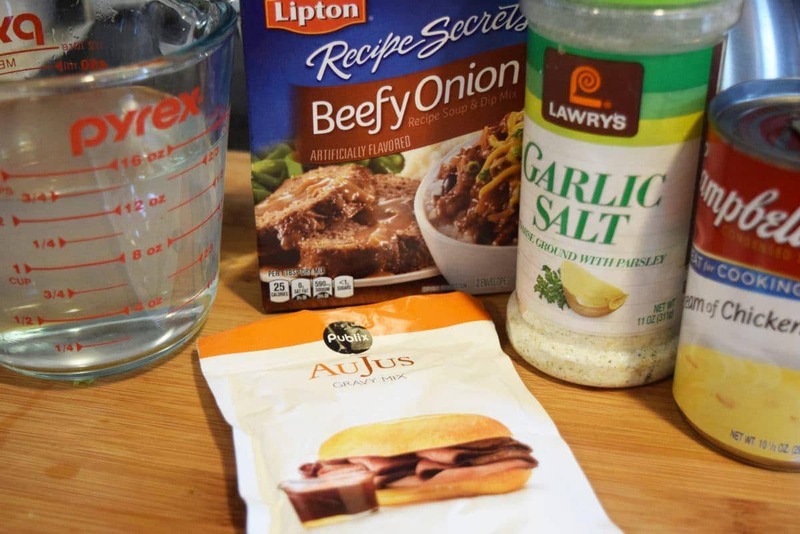 Sprinkle on the au jus and the beefy French onion soup mixes. Pour in 1 1/2 cups water and the cream of chicken soup. About 30 minutes before you want to serve take about 1/4 cup of the juice out and add 3 tablespoons of corn starch and mix until smooth. Or just mix your cornstarch with water. 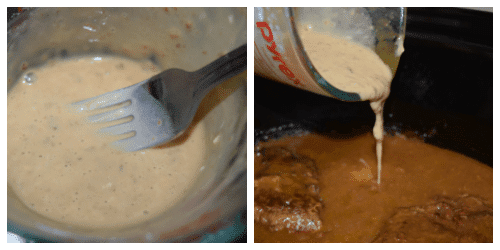 Pour back into crock pot, stir it around, and cook 30 minutes on high. 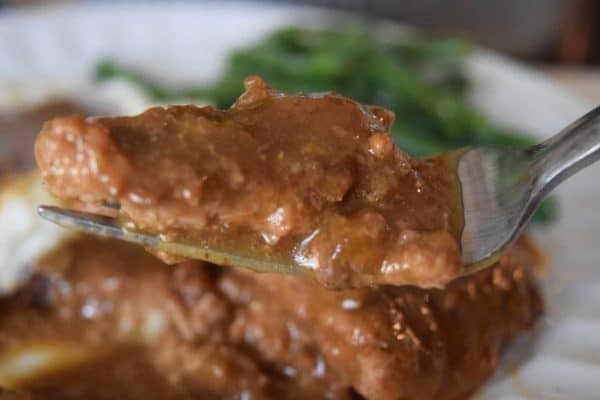 This will thicken the juices and make the most flavorful gravy. Now get ready to take a bite!! What did ya think? MMMM… GOOD right??? A few of my favorite kitchen (small) appliances you may love too! Ninja Multi Cooker – You can Saute (stove top cooking), Slow Cook, and it has an oven feature. Did I mention it’s non stick! Instant Pot – This is my fairly new found friend. This thing will sear, it’s an electric pressure cooker, slow cooks, makes perfect rice and more. I love using the pressure cook feature. It’s cooks in a fraction of time and gives the best flavor. I am always creating new Instant Pot recipes you can find HERE . Kitchen Aid Stand Mixer – I use this to mix almost everything, especially when I bake. But it’s fabulous to shred meat, mix bread dough, and mix really just about everything. I have a red one in my kitchen, but I am secretly eyeing this white one! Love, Love, Love it! Crock Pot – The handy dandy standard crock pot. This slow cooks to perfection. I love this one with the locking lid. It’s great for potlucks and traveling in the car with no spills. Spray the bottom of a 6-quart slow cooker. 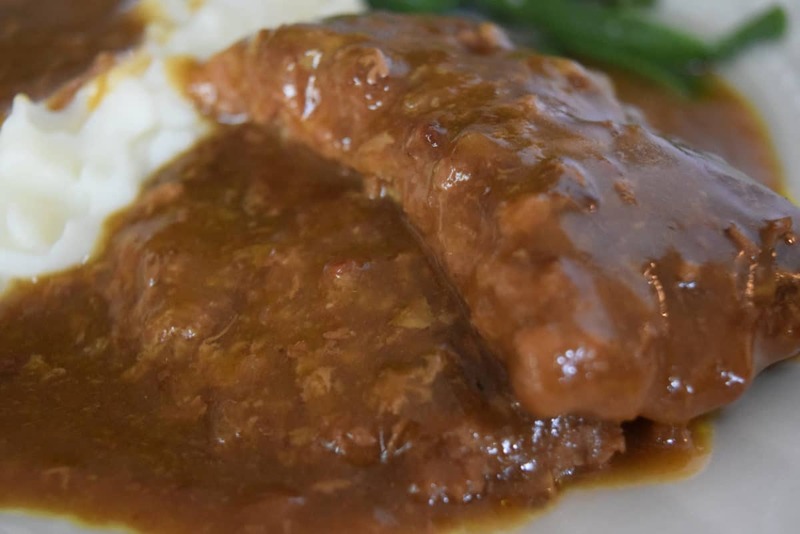 Put cubed steak in slow cooker. 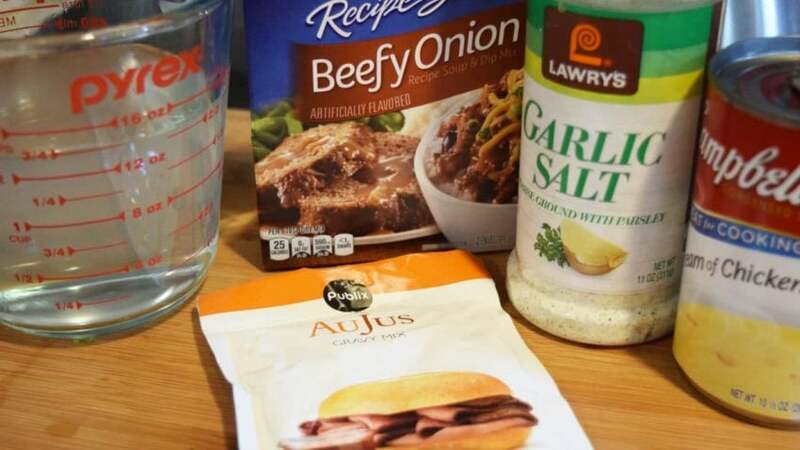 Sprinkle with au jus packet and beefy French onion soup mix packet. Pour in water and cream of chicken soup. Stir. Thirty Minutes before serving, in a small bowl, whisk together cornstarch and 1/4 cup of juices. Stir mixture into crock pot. Turn the setting to high and cook for 30 minutes or until gravy is thickened. Head on over to visit two of my favorite link up Weekend Potluck ! 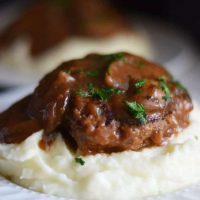 You can find this and other great recipes I know you will love them as much as I do! 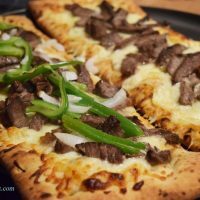 You’re featured on Meal Plan Monday this week! 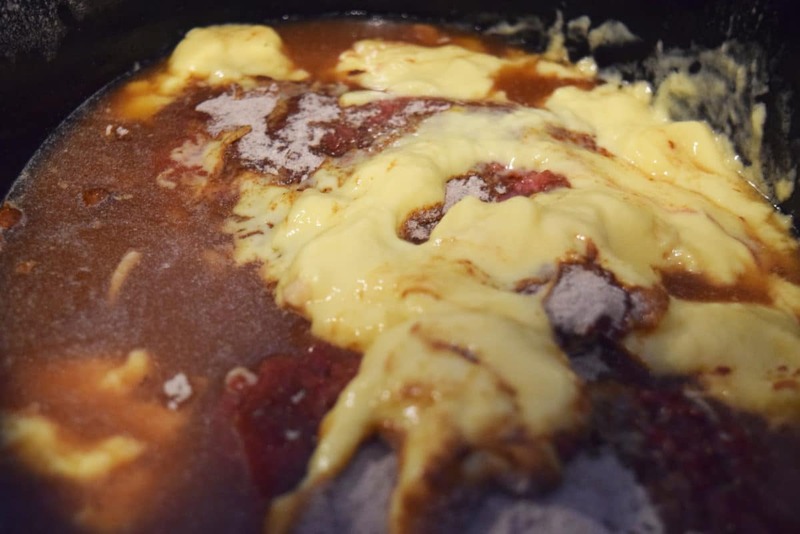 Thank you so much for submitting this delicious recipe. Has anyone tried substituting Cream of Mushroom soup for the Cream of Chicken soup? I usually have this on hand more than I do Cream of Chicken. Thank you for stopping by, I hope you come back often! I always make this with Cream of Chicken, but I am sure the mushroom will be delicious as well! I need to give that a try next time! Give it a try and let me kow what you think! I’m planning on making this, also only have cream if mushroom. Do have some chicken seasoning, the kind in a jar.anu feedback on using mushroom soup? Use the cream of mushroom soup it will still be fabulous. When you make it again try the chicken! See which way you like it best! They are both very delicious!